Welcome to Year 2 - Falcons! Welcome to your class page. Miss Smythe is your class teacher and your teaching assistant is Mrs Danks. On this page you will find curriculum information for this half term and general information about our class. Take a look at our long term plan and our Summer overview to see what we are learning about this term! Great Fire of London Recreation! 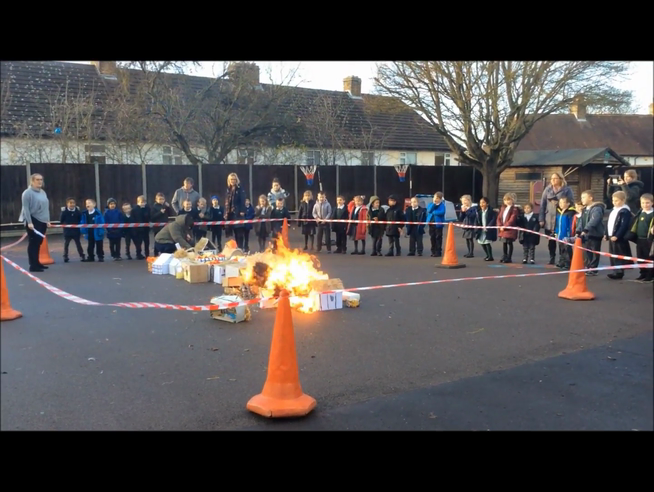 On Friday 30th November we re-created the Great Fire of London. We thought about what it was like back in 1666. As a part of our Fire & Ice topic, the fire service visited. They even dressed Miss Smythe up! We had such fun learning about fire safety. You will take your reading book home every day and these can be changed as soon as you have read your book. On a Friday, you will be sent home with spellings for you to learn; these will be tested the following Friday. On Fridays you will have the opportunity to visit the school library, if you return your library book each week you can change it for a new one on the following Friday. If you would like to play some learning games online, why not check out this one? We hope you enjoy being in Year 2!